Scores his fourth goal in as many games in sweep of Penguins. PITTSBURGH — In the calm, quiet, all-business visitors' locker room at the PPG Paints Arena, after the Islanders had finished their stunning sweep of the Pittsburgh Penguins with a 3-1 victory Tuesday, someone asked forward Jordan Eberle what it felt like during the series when the puck was on his stick. Eberle couldn’t help but laugh. Aside from goaltender Robin Lehner, Eberle was the hottest Islander in the series, scoring a goal in each of the four games. His goal Tuesday tied the score at 1 just 1:34 after Pittsburgh opened the scoring on Jake Guentzel’s goal 35 seconds in. It was the third straight game in the series in which the Penguins scored the first goal, only to have the Islanders tie the score almost immediately. 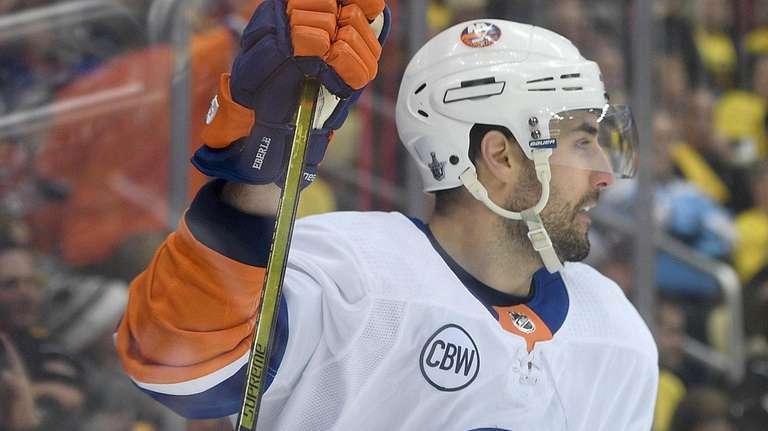 And it was the second straight time it was Eberle who got that tying goal – he did it in Game 3, scoring just 28 seconds after Garrett Wilso opened the scoring in that game, which the Islanders won, 4-1. Islanders coach Barry Trotz pointed to those quick tying goals as a turning point both in Game 4 and in the series. “We were able to respond right after a goal, and we really didn’t allow them to carry momentum for any length of time,’’ Trotz said. The trio of Eberle, Barzal and Lee totaled five goals and nine assists in the series. Eberle, the Isles’ leading scorer in the postseason, with 4-2-6, connected on four of 15 shots, good for 26.7 percent shooting. That was second to Josh Bailey, who scored three goals on nine shots (33.3 percent). Islanders sweep Penguins to reach second roundA regular season of surprising their critics turned into a true display of Islanders' resiliency in a clinically neat first-round dispatch of the Pittsburgh Penguins. The 3-1 win in Game 4 marked the franchise's first playoff series sweep since the 1983 Stanley Cup Final. Best: Islanders a team nobody wants to facePITTSBURGH - The last time the Islanders swept a playoff series, such things were old ... Game 4: Islanders vs. PenguinsThe Islanders beat the Pittsburgh Penguins, 3-1, in Game 4 of their Eastern Conference quarterfinal ... How the 2019 Islanders were builtA look at the Islanders' roster as they head to the Stanley Cup Playoffs for the first time since 2016.